Not long now until the 2018 Irish Open @ MNSCI on July 6th, 7th & 8th. 2018 is a very special year, as the NASRPC is 40 years young this year – so we plan to have a bit of a celebration. Over those 40 years we have seen many thousands of people compete in NASRPC competitions. Indeed, some of them are still competing, and winning, today. 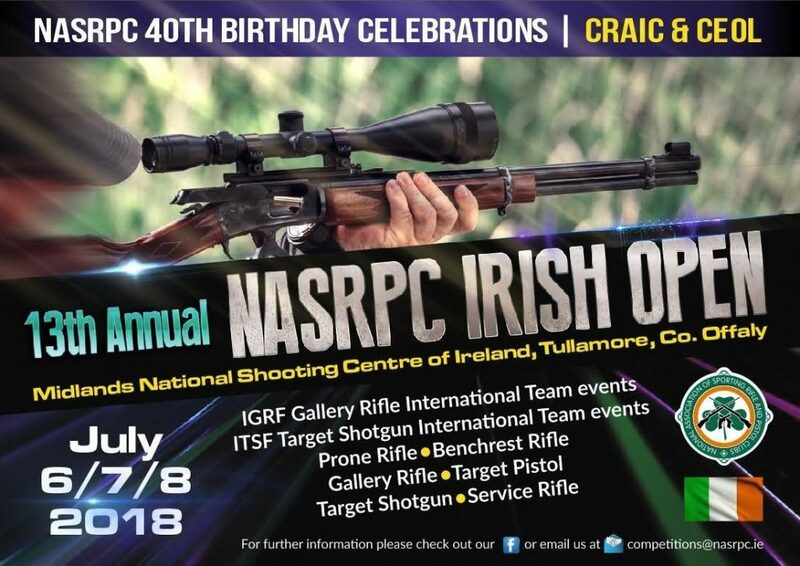 The Irish Open has been running since 2005 (We were called the NASRC back then and the event was hosted in Fermoy Rifle Club), with many International Competitors traveling to our shores to compete and enjoy the craic. A lot has changed since those early days – many of the fresh young faces that took part in that event,13 years ago, have aged gracefully and are still competing at the top level. Some of us, here at NASRPC headquarters, not so much. The event has been hosted in a number of venues since then – more disciplines have been added over the years; Target Pistol, Gallery Rifle, Target Shotgun, etc. – more and more clubs have been formed and grown the NASRPC – we have seen competitor numbers, both domestic and foreign, grow over the years – and we have seen many very happy faces, many for the first time, climb the podium to collect an International medal. Last years Irish Open was a particular highpoint, not only were Ireland hosting the IGRF World Cup for the first time – we also had teams and individuals travel here from all over the globe and we saw people from home and abroad produce some of the best shooting we have seen on these shores. But in the final tally, Irish Teams and Individuals produced the goods and were crowned World Champions in all categories. No pressure!! We hope to see many of you again this year for what will be a great event. We will publish the Match Schedule in May to allow people to plan out their weekends shooting – Registration will open the first week of June – following the Phoenix meeting in England. if you have any questions on taking part in the event drop a line to competitions@nasrpc.ie , where we will be glad to help. Any foreign competitors – either individual, or competing as part of a National team in the IGRF or ITSF events – need to be getting their Irish visitor permit applications submitted. The Gardai (Irish Police) estimate 6 weeks to process an application, although it often takes less. NASRPC, as always, can help with your applications and collect the fees at registration. The safe cutoff for submissions would be May 25th. Contact Karl O’Brien (vicechair@nasrpc.ie) or your respective team co-ordinators for more information.